Xavier voicemail boxes have a maximum quota of ~180 minutes of saved messages. Once this quota has been exceeded, callers will no longer be able to leave a voicemail for you. Internal callers will receive an undeliverable message; external callers will receive warnings that your voicemail box is full. Callers will be unable to leave you new messages, until you have taken steps to reduce the amount of existing messages. Saved voicemails messages will be preserved for 60 days, at which time the system automatically moves them to Deleted Items. This takes effect on your existing, saved voicemails older than 60 days - they will be moved to Deleted Items on 10/1/2016. Voicemails in Deleted Items will be purged automatically after 15 days, and cannot be restored by IT. Existing saved voicemails will need to be saved before they are purged. If you need to archive voicemail messages for longer periods of time, please submit a phone configuration change ticket. You will still be subject to the standard voicemail quota, except voicemails will not be deleted as part of the automated process described above. 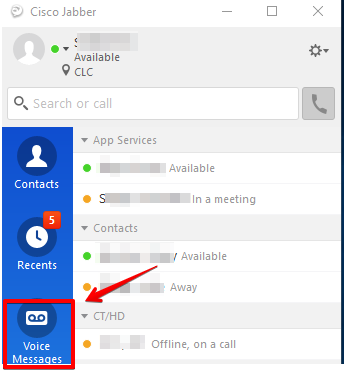 Note: You can quickly delete individual voicemails either through the voicemail system, or via the Cisco Jabber client. Dial into the voicemail system at x4321. Enter your PIN, followed by #. Listen to your messages. To delete the current message being listened to, press 3. The message will be deleted immediately. In your email client, highlight and delete the email message containing attached voicemail. Log into the Jabber client. On the left hand side, click on the Voice Messages icon. Right-click a voicemail message and choose Delete from the menu.